I've been expanding into some more jewelry with an eye towards practicing some fine wax carving. I had a few requests for horses on my woven chains, so here they are- kind of Celtic and kind of Urnesy. I really want to develop my own hybrid style and throw a little bit of Nouveau in as well. I want objects to look like they came from these ancient cultures but could also be something modern. 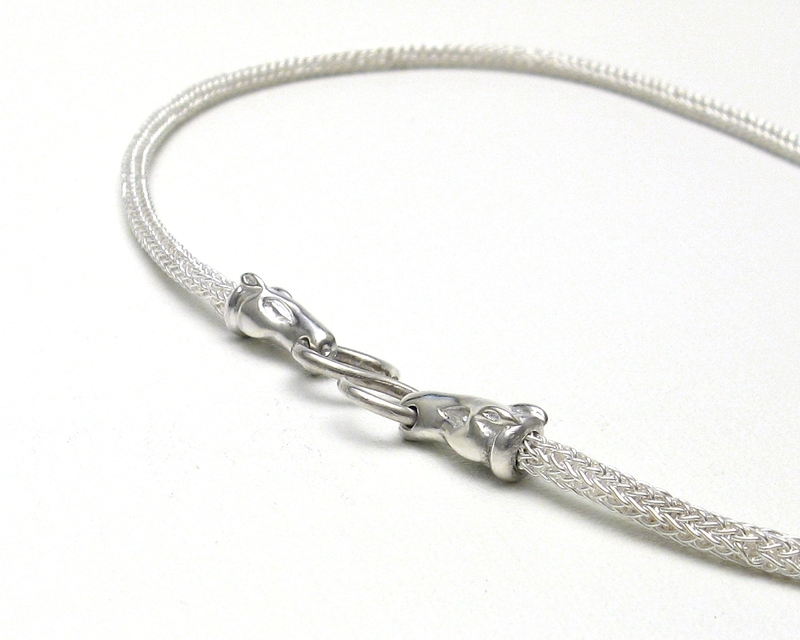 The chain is 22.5" long and 3/16" thick, woven with 5 loops in 24 ga. wire. The horses are 5/8" long. They are very tiny! They are really great! Neat work sir! May I ask how you attach the heads to the chain? Sure, Jerrod, they're very carefully soldered with medium silver solder @1375F or so. I like them. local artist was attempting to teach me that weave over the last two weekends while my stepson played his son in basketball. What you have done looks very good. I love thAt you made the clasp like bits in the horses mouth!! Great touch. BTW: Shane's wedding band was amazing bro. I got to check it out at the ceremony. (Shane Harvey, a forum member, got a surprise from his new wife w/ a wedding band made by Jul). Nice work man. Awesome man, i love the jewelry you have been doing. Interests:Kitchen knives, early European happenings, Wood carving, fermentation, primitive knowledge. Love it! Very Jarl Torque-ish. The chain is really nice as well, can't even begin to pick the pattern out looking at it. "Very carefully". When you feel the need to add the word 'very' to 'carefully' I get extra intimidated. I thought that was going to be your answer (solder vs. glue), but I had to ask to be sure. When my titanium ring bites the dust (gets lost, has to be cut off my broken finger, finger gets too fat, or who knows what else may happen) I'll be pushing hard for one of yours as a replacement. Shane's got a winner for sure! I'm thinking my wife may just want the matching set. A guy can dream... Thanks J.
Wow-I love this. I love going to your site and perusing the amazing stuff you do. I find it amazingly impressive the variety of different things you can do so well. It's incredible. The chain in particular is so nice. What fine work. Interests:Reading, knifemaking, engraving and the woods. 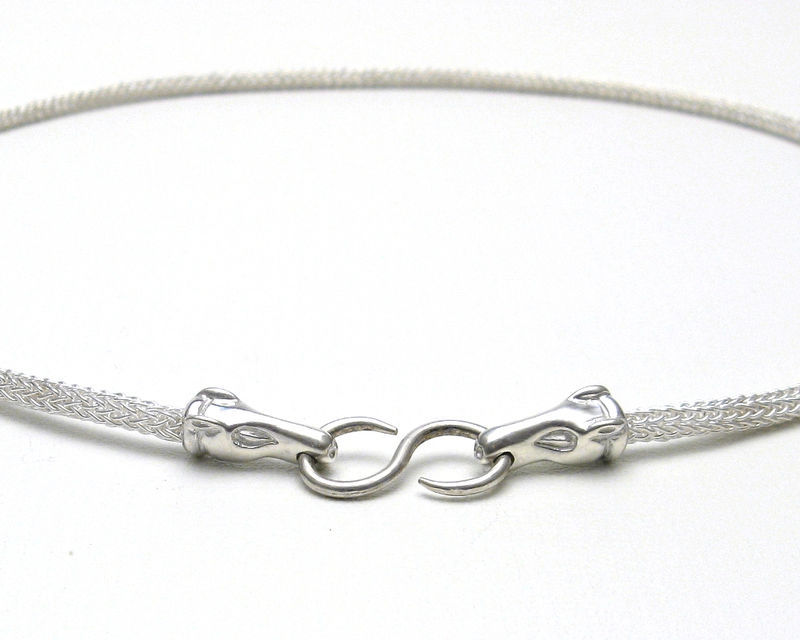 Beautiful silverwork! Really impressive and inspiring to see. Interests:Spending time with my wife, physical fitness, Paleo ways of eating, hunting-mostly archery, bladesmithing, leather tooling and Blackberry Smoke. such intricate work. I cant see well enough to do that kind of work. Well, I lack the skill as well but that's beside the point. lol. kidding aside that is awesome work.